How might we use sound to guide a visually impaired parent through the bottle-feeding process and make them more independent in raising their children? For blind or visually impaired parents preparing a baby bottle is one of the hardest things to do. For preparing these bottles most of these parents rely on the help of others. 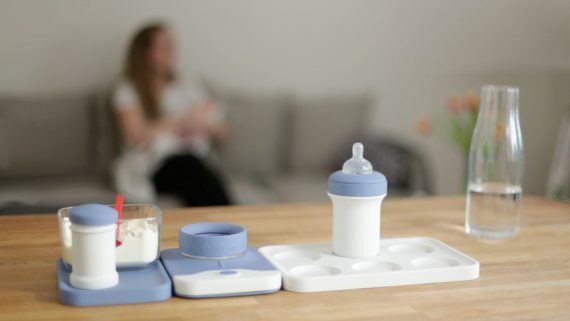 OVE is a baby-bottle preparation station designed to help visually impaired parents through the process of making a baby bottle. By bright lights, audible feedback, and tactile information the parent is guided through the process of preparing a baby bottle. OVE helps to pour the right amount of formula, heating the bottle to the perfect temperature and is easy to navigate and use. OVE consists of three modular elements. For blind or visually impaired people structure is very important, so to provide this, two side trays were designed to store the necessities of the making process always in the same location. The trays are provided with an edge that slightly lifts, so the edges can easily be detected through touch. The smart scale element can be set to the age of the baby, this function is supported by braille and high contrast letters. When placing either the bottle or the powder container the scale detects which one is placed. By means of bright light and sound, the user is supported to pour the right amount of powder or water. Lastly by pressing the 3D embossed heating button, the station heats up the bottle to the perfect temperature. Baby feeding is a magical and emotional moment for parents, and a great time to bond with the baby. OVE is encouraging the parents to be involved in the process of bottle preparation and feeding and gives them the ability to deal with unexpected situations and to be more independent. During our process two interviews with visually impaired parents were conducted. Neither of our interviewees had ever attempted to make a baby bottle by themselves. We made a task analysis listing the important challenges, pouring the right amounts of water and powder, working hygienic and locating the parts. During our process multiple models were made and using a wizard of Oz technique these have been tested. By means of creating a unified sound language, providing tactile feedback and even bright visuals the user is guided through the process. In the end a hi-fi working prototype was created and tested. The main goal of the project was to have an ‘inclusive’ design, a design that is needed by some yet good for all. The starting point was to make a design that both looks and feels good. Several colours are available, as both visually and sighted people desire and deserve products that look good in their home.